Granger completed this award-winning, post-tensioned concrete parking ramp on the campus of Michigan State University in December 2006. During construction, many people asked what academic department would utilize the new brick building and were shocked to learn that it was actually a parking structure. 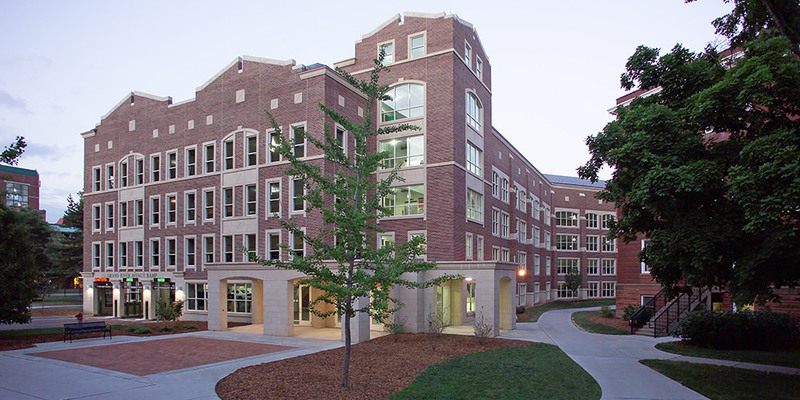 The new building was designed and built to blend seamlessly into the collegiate gothic architecture and pristine setting of the surrounding buildings. Other challenges included an aggressive schedule and working on a tight site located adjacent to East Lansing’s busiest four-lane thoroughfare (Grand River Avenue) and only 40 feet from one of the first buildings ever constructed on campus. Granger reconfigured the construction sequence of the project to better meet the fast track schedule and the tight footprint, which led to increased efficiencies and early delivery. Based on these complexities, the team’s exceptional performance and the fact that the building was completed seven months early and within budget, this was the first-ever parking structure to win the Build America Award from the Association of General Contractors. It was also selected as a 2007 Build Michigan award winner. Early turnover eliminated MSU’s need to rent parking space from the City of East Lansing seven months ahead of schedule, saving the University $35,000. It also enabled MSU to begin generating parking revenue seven months ahead of schedule. Fishbeck Thompson Carr & Huber and Carl Walker, Inc.